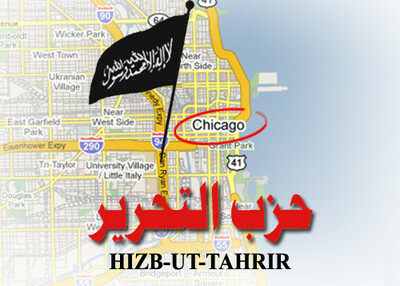 Oak Lawn, Illinois – Hizb ut-Tahrir (HT), the international movement to re-establish an international Islamic state ­ or Caliphate – kicked off a new campaign to win American recruits Sunday afternoon in this Chicago suburb. Nearly 300 people packed the Grand Ballroom of the Hilton Hotel for its Khalifah Conference on “The Fall of Capitalism and the Rise of Islam” to listen to HT ideologues blame capitalism for World War I and World War II; the U.S. subprime mortgage meltdown; the current violence in Iraq and Afghanistan; world poverty and malnutrition and inner-city drug use. Hizb ut-Tahrir aims to restore the Caliphate that existed during the Ottoman Empire in Turkey. Turkish leader Kemal Ataturk abolished it in 1924 in an effort to create a secular, Europeanized state. Security at the conference was very tight. Oak Lawn police maintained a checkpoint outside the Hilton, and local police and HT’s own security people had a substantial presence inside the hotel. In the ballroom where the conference took place, men and women were largely segregated, with men in the front and women in the back. This became a significant point of contention between HT supporters and several members of the audience who objected to this arrangement. At one point, an unidentified Hizb ut-Tahrir speaker became flustered over this line of questioning. A woman in the audience responded: “How does intermingling between men and women make you animals?” HT panelists didn’t have a persuasive answer, and soon adjourned that session. The conference was sometimes poorly organized. There was no list of speakers, forcing reporters to sometimes guess at the spelling of speakers’ names. But HT certainly appeared to be serious about working for the larger goals of the conference: abolishing capitalism and imposing Caliphate rule over the world. “Secular capitalism has made me devalue my skin” and “has kept my family in ghettos,” said one speaker, an African-American who went on to blame it for the fact that he smoked marijuana and his grandmother played the lottery. Capitalism, he added, is a form of economic “terrorism” and “causes us to be sent to mental hospitals.” Barack Obama’s presidency, he said, “is only a scheme or con” to trick people into thinking that things will get better under capitalism. But time and again on Sunday, Hizb ut-Tahrir officials seemed to be playing slippery rhetorical games of their own – particularly when it came to the behavior of despotic Muslim regimes and terrorists. When a few skeptical audience members pressed speakers over the fact that Islamic governments in Iran and Saudi Arabia are despotic, conference speakers claimed those weren’t “authentic” Muslim governments and that the CIA (and by implication, the capitalist U.S. government) was to blame for the problems in those countries. In an interview with WBBM-TV in Chicago, HT deputy spokesman Mohammad Malkawi refused to specifically condemn Al Qaida and the Taliban. One Muslim American group issued a statement in advance of the conference condemning Hizb ut-Tahrir’s radical ideology and challenging others to follow suit. HT’s efforts to rehabilitate its image won’t be helped by the menacing tone on display Sunday. One late-afternoon panelist suggested that modern industrial powers could fall to Muslims the way Mecca fell to Mohammed nearly 1,400 years ago. While Hizb ut-Tahrir’s controversial message attracted demonstrators and some media attention, the group at least is open about its ambitions. It not only is determined to destroy capitalism — it would shred the United States Constitution as well in favor of Shariah law.